AC Conversion: Home-built and fast! I just got a chance to talk to Eric Tischer,who's done the best homebuilt AC conversion of a Volkswagen Passat I've ever seen, I don't mind saying. Sure, he's got a degree in Mechatronic Engineering (mechanical engineering, computer-driven control - sound familiar?) and has a hobby of making major changes to cars...but he says that anybody could do a decent AC conversion, with the right stuff, and it doesn't have to cost so much. Lynne: Why did you decide to build an electric car? Eric: I had done a few other engine swaps before my electric conversion. In 1998 I did my first engine conversion. I was 21 at the time. I bought a 1973 MG midget convertible and a 1985 RX-7 and decided to do a motor swap. It took me just over a month from the time I bought both cars, till the day the MG was driveable with the RX-7 rotary engine and 5 speed. The car was dangerously fast, especially since I had the stock 155/80 r13 tires on it. The engine would wind up till the carbs could no longer supply enough fuel, about 8k rpm. The car sounded so sweet, but it was constantly snapping axles and I decided to move on to something better. My second conversion was Subaru turbo flat 4 in a Porsche 914. 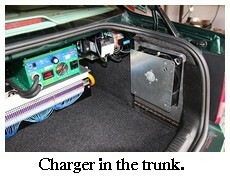 I designed the cooling system and heater core heater. I built the motor mounts and exhaust, fuel injection harness, and even designed a cable shift setup to replace the crude shift rods. Believe it or not, it only took me 3 days to convert the car from an air cooled Porsche, to water cooled Subaru. The car was not super fast, and after destroying several turbo motors I decided to upgrade. The last turbo motor went with a bang. It had a leaky head gasket and was constantly backfiring. One backfire exploded the top of my intercooler off and in the rear view mirror all I could see was a mini fireball blowing though the rear deck lid! I eventually switched over to the 2.7 flat six Subaru motor, and ran that reliably for several years until I sold it. The car sounded just like a mean 911. After I sold these cars, I wanted to do another conversion, but something different, and something where I can put my mechatronic skills to good use. At the time, gas was around $4.50 a gallon, so building an electric car was perfect. Lynne: It just happened to coincide with your interests to build an AC conversion, then, and the price of gas made it even more logical? No "save the whales" or "peak oil" motivation? 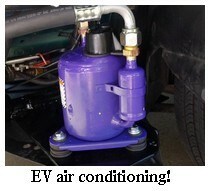 Eric: The price of gas certainly sparked my interest in making an electric conversion. It is a shame there are no affordable electric cars on the market, I think they would sell quite well. For now the only way to get one is to build it. Lynne: How much did the project cost you, if you don't mind me asking. The reason I ask is that the control portion of an AC system is the most intimidating part of building an AC conversion, and I'm dying to know if the diy factor brought the costs down. Not to pry or anything. Not me. Eric: I have spent around 20k including the car. Part of that 20k was used to build three motor controllers. The first prototype blew up after about a week of testing. The second one was limited to controlling only speed. The third one, which I am still currently using can control speed and torque. If I were to do the conversion again from scratch, it could probably be done for about 15k. Half of that would be used for batteries, battery management, and a charger. Lynne: This is a very good price for a good AC conversion, anyway. Lynne: You've got a 300v system in your AC conversion. And air conditioning, too. Dude, 300 volts is a whopper with cheese compared to most of our modest little 120v DC conversions. I've heard a lot of folks complain about their AC conversions having, quote, bus-like acceleration, end quote, but they've gone with 120v systems. Your AC conversion, on the other hand, doesn't resemble a bus in its acceleration at ALL, and I suspect that 300v system might have something to do with it. Most DC motors can only spin as fast as the battery voltage will allow it. 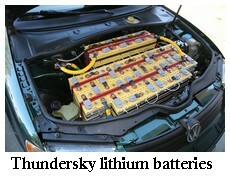 For example, 100 volts might generate 2000 motor rpm. If you want more speed 140 volts will get you to 2800 rpm. An AC motor can spin at any speed regardless of voltage, because the rpm is related to frequency. This is the frequency of the 3 phase sine wave being generated by the motor controller (inverter). My AC motor speed is limited by the bearings, about 10,000 rpm. Lynne: You commute with this car? Eric: This car gets me to work everyday. I drive about 20 miles at 65 mph, and this requires me to charge the car for about 3.5 hours at 18A 115v. The car will easily break 100mph, but the fastest I've gone so far is 98.6 mph. The car is about 500lbs heavier than stock, with most of that weight in the trunk. I've driven the car about 450 miles in the last two weeks, I love how quiet it is. My heart was beating so hard the first time I drove it on the street, I was quite surprised it was actually working. Lynne: I can imagine! Is this the first EV you've driven? Eric: This is the first. It was especially exciting since I had been working so hard to get the controller to work. 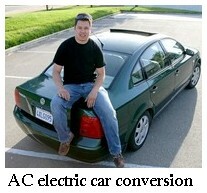 Back to Electric Car Conversion.